The situation where you have to take two steps back to take one forward is widely accepted in both amateur and professional pursuits alike. In golf, for instance, returning to a teaching pro to iron out bad habits will add a few shots to your game until you are back in the groove again. Many professional golfers have been known to do this and completely rebuild their swing and following a few negative results they usually go on to win a number of Majors. 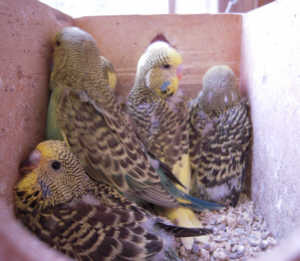 However, when it comes to breeding exhibition Budgerigars the need to go back to move on, although still relevant, needs to be viewed in a totally different manner. Most fanciers, I assume, would consider reducing overall size in their birds as the obvious “move backwards” but in my view this is to be avoided at all costs. Balance is the key to top quality show birds and I do not believe that any fancier today has birds that are too large and that this commodity can be sacrificed in any way, shape or form. Size is paramount and needs to be a fixed feature in a successful stud. There are other features that I believe should also be maintained and never sacrificed at any cost; the absence of a hinged tail for instance. A hinged tail on a show bird is a dreadful fault and is a fault that is sometimes not evident until the bird is placed in a show cage. With the additional insecurity that the cage gives the bird, its tail hinges at 30 degrees to the backline. Apart from looking awful the bird can no longer stay on the perch at the overall correct angle due to the overbalancing effect that the tail has, resulting in an even worse appearance. The hinged tail effect is hereditary and will be passed from generation to generation. Irrespective of other qualities, no outcross showing this fault should be used – it may not show in the immediate offspring but will certainly manifest itself in future generations at some time or another and will be extremely difficult to eradicate. Another aspect not be toyed with is a good backline. A quality bird can easily be spoilt by a bumpy backline. The imperfection on the back of our birds can show as a hump high on the bird, almost as though accentuating the shoulders at the rear. Alternatively, the hump can be low down on the back. Both spoil the bird. As with the hinged tail, this fault will be passed to future generations and will prove a serious hindrance to your future on the show bench. A few seasons ago many of the birds that were appearing on the show bench did not have a good overall shape. They were ragged in appearance, not too good in showmanship and looked large and heavy. In fact, much of this appearance was caused by the change in feather texture; away from the yellow feather and a move towards the buff feather. This could clearly be seen as a retrograde step but as it has turned out, only a short lived one. 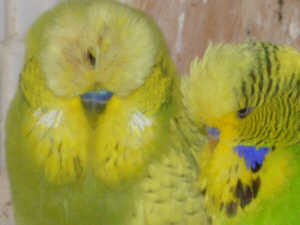 Today, top breeders have got their act together and have managed to control feather texture, returning their best birds to very attractive, highly show-worthy Budgerigars. This is an excellent example of moving one step back to go two forward. On the show bench today, it would appear that the area that is receiving great attention by breeders is the mask, including the spots. In an attempt to deepen the mask and increase spot size, the spots on some birds are currently below the lower mask line. This does little to enhance the overall beauty of the exhibit at this point in time but is an ongoing example of the theme of this article. In the past, spots have received considerable work to them, much of which has been through the use of heavily spotted and equally heavily flecked Opaline hens, paired toNormalcocks. Improvement in this area was made but unfortunately many flecked birds started appearing on the show bench. An attempt to eradicate this by banning them from the bench was made but this was not successful. Today flecking is seen as a show fault and birds are judged accordingly. Fortunately, flecking is also seen to be visually undesirable and so unless the bird is supreme in all other respects not too many of them I are seen on the bench. When introducing an outcross that excels in a particular feature that is lacking in a stud of birds it is very rare indeed for the outcross not to carry other visual faults. These need to be weighed up very carefully against what this bird can potentially offer you to ensure that you get the maximum gain and the minimum loss. It certainly can be accepted, as has been shown, that certain sacrifices may have to be made to the eventual benefit of the stud. These may slow you down for a couple of years but that should be all. Finally, you should always remember that just as it may take two or three generations of breeding before the good features of the outcross show through – so it does it take this time for the bad features to come through in the youngsters bred. Perfect shot Terry well done really like your article. I’m beginner in golf and what my trainer told me as instruction as golfer must learn is motion.It’s all on body action and then all swing because either it is in breeding budgerigar or in any game or sport we can not make the right position without motion.It’s vital for playing. I must agree with you take two steps back to take one forward and that’s why we are learning correct motion and correct action from you.